My studio is well and truly looking like Spring has sprung and it is filled with watercolour sketches and drawings of poppies. Two weeks ago I embarked on the Poppy Spree over at Studio Margot and spent a couple of glorious weeks having fun and being very free and messy with the paint and while I find it surprisingly difficult at first, as week 1 bled into week 2 I found it easier and easier to free up and move away from my usual botanical art style which is my default the minute you place a flower or piece of fruit in front of me. I think I have concentrated so hard over the last few years on regaining my rendering and observation skills, that it was quite a departure to just play with botanical forms. I love botanical art but have found more and more this year that I have been taking the rendering and observation and applying them to other areas of my art, and have really enjoyed the results and the ease with which I can now express myself visually.This week I find myself starting to come back to injecting a bit more me into the poppies. I am still trying to keep the painterlyness... I am sure that is a word even though spell check will probably disagree ... but find a bit more detail gradually. They aren't quite there yet, but as there is still a week and a half of class ahead of me I'm not in a hurry and I know they will find the balance between being loose and yet still having structure. A huge thrill for me was that Studio Margot invited me to be guest artist for this week on the poppy spree. My first flatmate and fellow Bundilla Babe, Melissa, cyber introduced Studio Margot and I and it was poppy love at first glance at each other's work and I was beyond flattered and touched by the support and acknowledgement by someone who I admire. 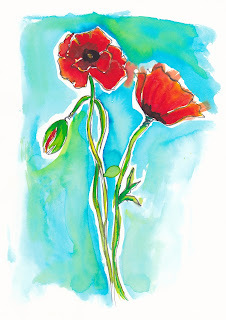 It was great putting together some information on how I have approached poppies in past. Of course I think that after this poppy spree I never be able to return to botanical rendering of poppies again, but nice to have my boundaries pushed and I can't wait to see where my poppies end up by the end of the course.... and beyond ! 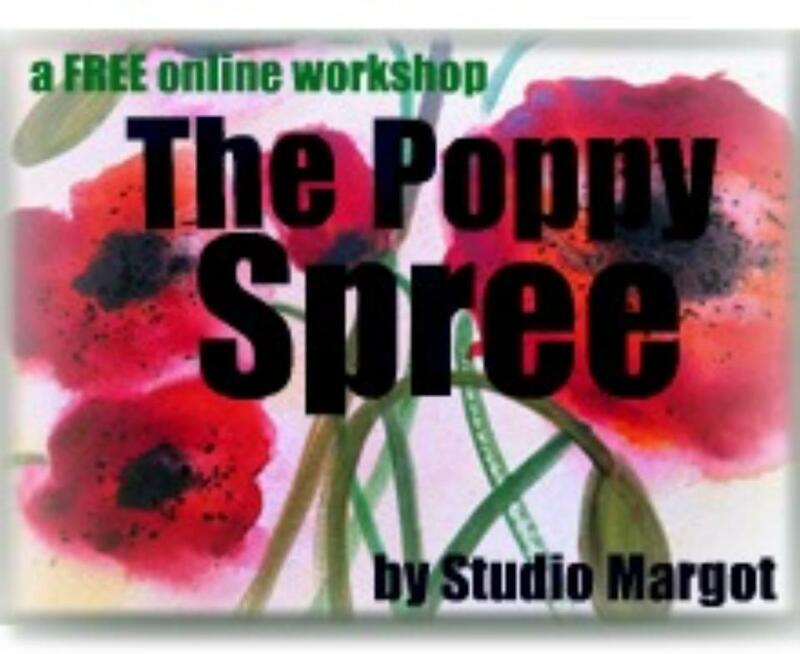 Love your poppies, can't wait to practise your lesson on the poppy spree. Won't be until next week now. It was an honor for us to have you over the Studio Margot for such an exciting class - very beautifully explained and illustrated! You know I was your poppy-number one-fan!! It makes me really happy that The Poppy Spree had (has) such an influence on your art - because I really think your art is just stunning!! 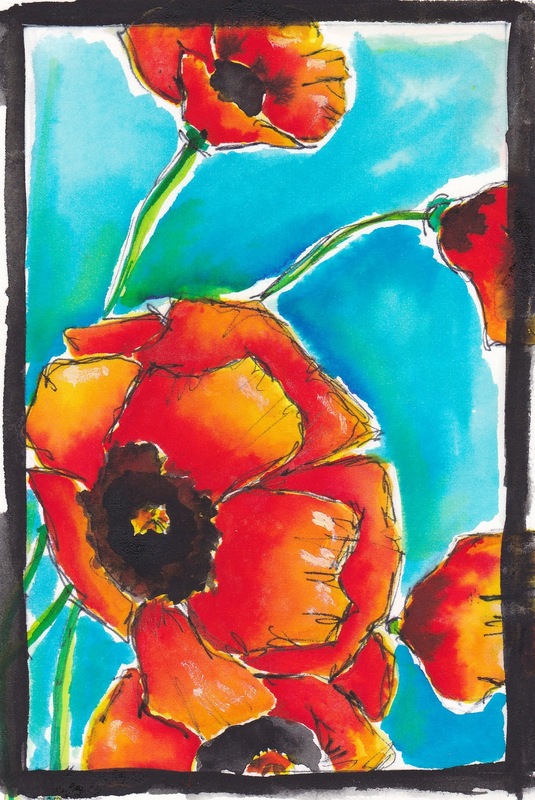 Beautiful Tracey...I love your poppies! Love your vibrant colors and the sheer creative brilliance of the charcoal sharpened seeds! Xox. Your post has made me so delightfully happy!! Your poppies really POP! Sorry I couldn't resist that. The first picture has such gorgeous color with the reds and oranges against the turquoise. Love them all! 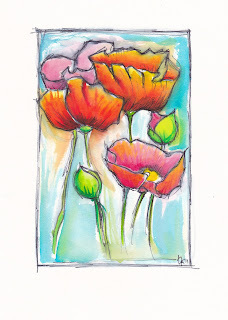 I totally love your poppies - their carefree colorful style is just perfect!